Charlie Fox is the 23rd of 85 Bristol Britannia built, and one of 30 built by Short Brothers in Belfast. When construction started, it was one of five Series 300 aircraft ordered by BOAC, and was modified to the longer range Series 305 on the production line. 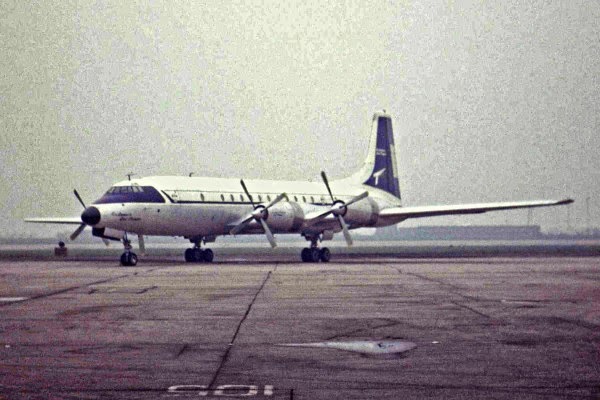 BOAC then cancelled their order in favour of strengthened Series 310's, and Capital Airlines expressed interest in the remaining 305's, although an order was never placed. Northwest Airlines then ordered the aircraft, but this was also frustrated due to credit problems. The Britannia made its maiden flight with test registration G-18-4 on 19th November 1958, and subsequently registered as G-ANCF. It was August 1959 before a buyer was found, and was converted to Series 308 configuration for Transcontinental SA of Argentina. This included a roomy cabin with 104 seats instead of the possible 132, and a cocktail bar in the rear. Registered as LV-PPJ for the delivery flight, it left Filton for Argentina on 16th December 1959. Famous photograph of LV-PPJ on its delivery flight. In service with Transcontinental it was registered LV-GJB, one of two Britannias acquired to operate on the Buenos Aires – New York service to compete with Boeing 707s of Pan Am. Sadly the airline went into liquidation two years later. 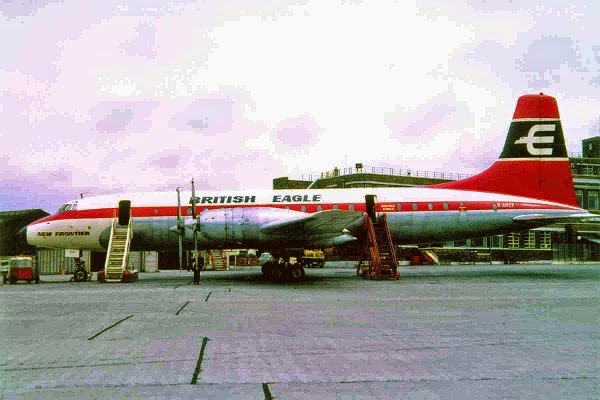 Both Britannias returned to the UK in 1964 for service with British Eagle, a long-distance scheduled and charter flight operator with an sizeable fleet of Britannias. Both were converted to carry freight, with the addition of a large freight door. G-ANCF was the first Britannia to be so converted, and entered service on 2nd July 1964, named 'New Frontier'. Charlie Fox primarily operated the Ministry of Defence charter from the UK to Woomera in Australia. Woomera was used for missile testing. G-ANCF at Liverpool Speke in 1964, in almost exactly the same spot as she is today. On 6th December 1968 British Eagle ceased operations, as a result of an economic depression and a recession in the inclusive tour market. Monarch Airlines had started in 1967 and operated three Britannias at the time when British Eagle closed down. As an established Britannia operator, Monarch were able to take over the UK-Woomera contract, and immediately acquired G-ANCF. Charlie Fox continued to fly this route, along with other MoD charters to Cyprus, Oman and Singapore. By the early 1970s, Britannias were becoming dated, and passengers preferred faster modern jets. By 1975, G-ANCF was the only Britannia left in Monarch's fleet, still operating the Australia run. The MoD contract ended in December 1975, and Charlie Fox was withdrawn for use and sold to African Cargo Airways in February 1976. 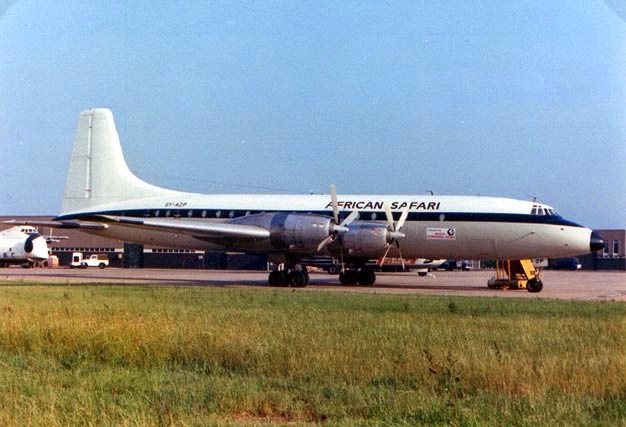 Registered as 5Y-AZP with 'African Safari' titles, Charlie Fox was one of two Britannias flown by African Cargo, used on cargo charter flights within Europe, the Middle East and India. 5Y-AZP at East Midlands Airport in June 1976. 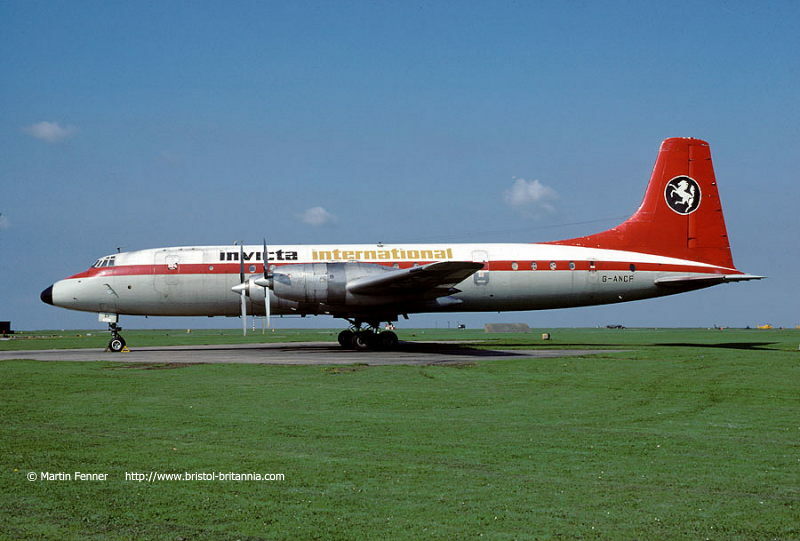 African Cargo struggled to survive, and after only four months Charlie Fox was leased to UK-operator Invicta Cargo Airlines, who acquired her outright in January 1977 and re-registered her as G-ANCF. Invicta was a pure-freight company, operating Britannias on varied cargo charters around Europe. After a long career flying around the globe, G-ANCF was withdrawn from service after Invicta ceased business, making her final flight to Manston on 30th October 1980. 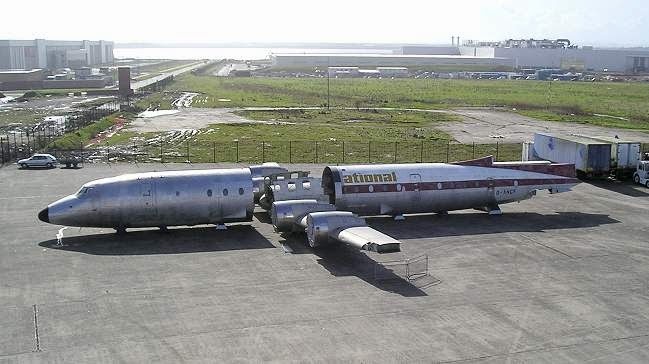 She remained parked on the airfield until rescued by Roger Hargreaves of Proteus Aero Services in 1985 for preservation. G-ANCF parked at Manston in 1981. She was carefully dismantled in to roadable sections, and moved to the Brooklands Museum in April 1988, until a permanent home could be found. The centre section and wings later moved to Quedgley in Gloucestershire, and the forward and rear fuselage sections moved to the Bristol Aero Collection's home at Banwell in Somerset. When the Bristol Aero Collection found a new home at Kemble the sections at Banwell move here, along with the parts at Quedgley. Following a downsizing of the museum in 2006, the aircraft sections were stored on Kemble airfield until a new home was found. G-ANCF in sections at Speke, not long after arrival. In January 2007 it was announced that the former Speke Aerodrome, next to Liverpool John Lennon Airport would be the new home for Charlie Fox. The aircraft will be restored and parked on the apron outside the art deco terminal building, now the Crowne Plaza Hotel. She will be repainted in the colours of British Eagle, as carried by Charlie Fox from 1964 to 1968. This location is highly appropriate, as Liverpool Speke Airport was one of British Eagle's bases, and it undertook maintenance on the Britannia fleet here. G-ANCF under restoration at Speke.